I have some good news for all of you! I will be creating the winning recipes for #FlatoutLove to be featured on ChicagonistaLIVE. You can follow along with me through all of my social media channels as well as with #FlatoutLove or #ChicagonistaLIVE. I am excited to see what flavors you feel represent your city. Chicago is a diverse blend of cuisines so I was lucky enough to try a food that I hadn’t had before. 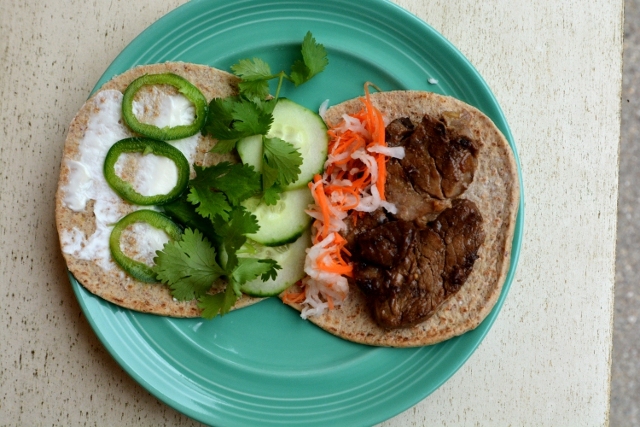 A bahn mi is basically a sandwich. Bahn mi really just means bread, however it also means a Vietnamese sandwich. With bold flavors and quite a distinct way of adding sour and citrus to your mouth. I’ve learned that there is usually pork, along with a pickle of some kind, sliced jalapenos and cucumbers. With a bit of cilantro which really gives it a distinct flavor you can’t replicate with anything else. There is one more ingredient that you cannot do without. Do not skimp on the fish sauce. You won’t necessarily find the smell pleasant if this is new to you. However, the flavor will not be the same if you skip it. We are talking real depth of flavor that this unique sauce gives to many Asian dishes. Fish sauce is extremely similar to Garum, which is what the Romans made from fermented fish. This was a condiment that was exclusive. They would put it on everything and the reason is clear once you taste a dish with fish sauce. There is nothing like it and you might even be tempted to fight for your bottle. With those things in mind, you can really substitute my quick pickle with one you prefer. Really we’re looking for that acidity and sour to counteract the richness of the meat. I went with a marinated pork tenderloin. Which you should slice first to really let the flavors sink in to your pork, otherwise your marinade is really only on the outside. This is all about throwing together a lunch from what you have on hand. 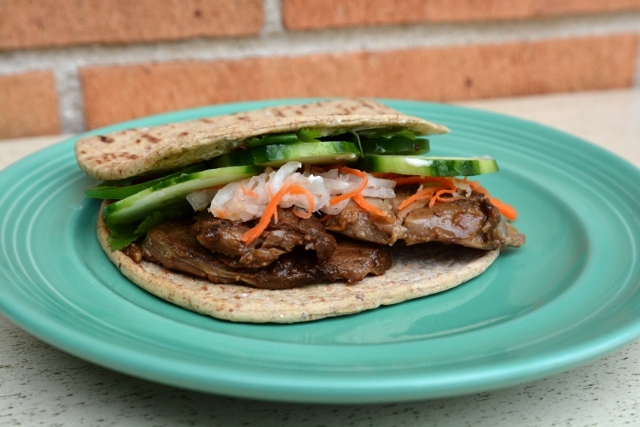 A Bahn Mi that you can make easily without missing out on flavor. Julienne your vegetables and place in a mason jar. Combine vinegar, sugar and salt in pan, heat until dissolved. Pour over vegetables and allow to cool before placing in the fridge. Refrigerate at least 1 hour to overnight. Mix all of the spices with your pork. Marinate at least 30 minutes in a bag in the fridge. Grill about 4 minutes, caramelizing both sides or until it is 145 degrees Fahrenheit or pan fry until cooked through. Open up your Flatout bread. Spread mayo to your liking. Top with pork medallions. Then pickle which you can strain or squeeze out the extra liquid. Add cucumber slices and jalapeno before topping with cilantro leaves.